Joel Pereira, one of the last known players of the instrument, is training students of a local college to play the Konkani folk instrument. While the ghumat was once a popular percussion instrument used by the Konkani community of the coastal districts of Karnataka, today it is on the verge of extinction due to the dearth of players. Now, one of the last known players from the Catholic Konkani community who is keen on not letting the tradition die has taken up the task of its revival by training students and passing on the legacy of the culturally significant instrument. 55-year-old Joel Pereira says that he learnt to play the ghumat from his father and famed ghumat player Joachim Pereira, who in turn learnt it from his father Alex Pereira. Joel has been training around 40 students of Mangaluru’s Milagres College to play the folk instrument as well as teaching them the traditional songs that usually accompany the ghumat. “I have taken up one-day workshops on ghumat. I trained a batch of students at Belman in Udupi district and also the seminarians at St Joseph Seminary, Mangaluru. However, this is the very first time that I have been invited as a resource person for a certificate course,” says Joel. The instrument was a must at Catholic Konkani roce (pre-wedding ceremony) and wedding ceremonies till about 60 years ago. Joel says his grandfather picked up the skill by just watching ghumat troupes. However, today apart from a few Konkani cultural programmes, the instrument – basically an earthen pot with two mouths, where the larger is covered with the skin of the monitor lizard – is rarely seen. “The main reason could be that people find the instrument primitive. While Konkani communities such as the Kudubis and Kharvis are passionate about the instrument and use it for their celebrations, among Catholic Konkanis it is no longer prominent, as most of the celebrations today have a western influence,” says Joel. 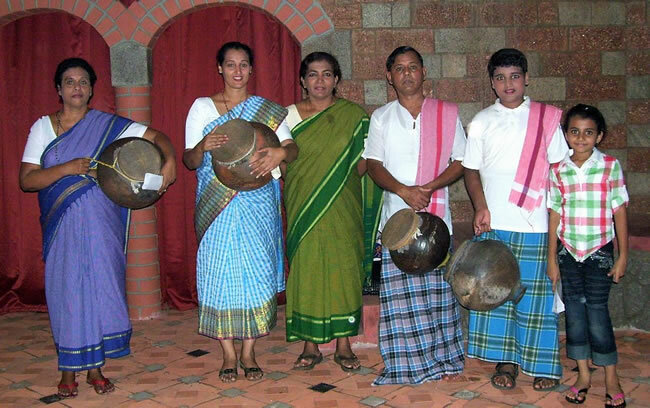 Joel says that his troupe used to be invited to perform at traditional Konkani ceremonies such as the roce, but over the years the requests have stopped. “Very few are aware of the instrument and its significance. Last year we received a request from only one family,” he adds. Joel got an opportunity to professionally teach the instrument to students when Milagres College started a three-week certificate course on the ghumat. “There are 40 students who have taken up Konkani as an optional subject in their graduation course. 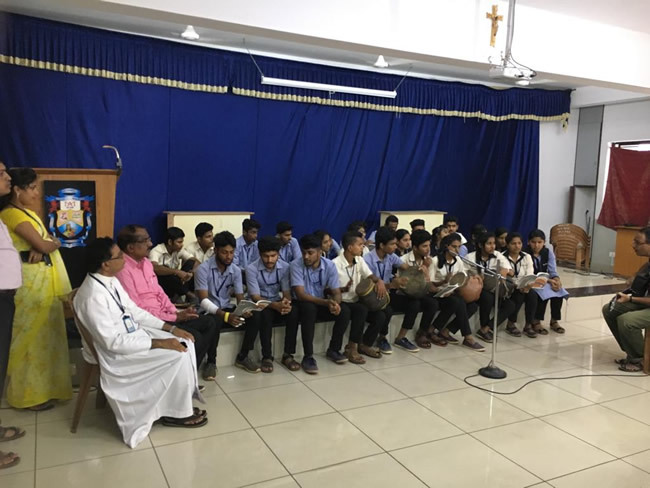 Last year, we had brought a person to show them how the ghumat was played and a few days later, some students expressed interest in learning the instrument,” says Fr Michael Santhumayor, Principal of Milagres College. Fr Santhumayor approached the Karnataka Konkani Sahitya Academy with a proposal for the course, which the Academy approved and also decided to fund. “We could not think of anyone other than Joel to teach the course, as he is one among the very few families that still play the instrument and know the tunes of the songs that are sung while playing the ghumat,” says Fr Santhumayor. Most of the songs sung with the ghumat are passed down through the generations verbally. There are holy songs such as ‘Ruzai Saibin’, ‘Santh Francis Xavier’, ‘Sath Sacramenth’, songs that impart values and advice, and the ones that are sung in traditional Konkani ceremonies. “Through the course, Joel is passing this rich legacy to the next generation,” says Fr Santhumayor. Fr Santhumayor adds that the biggest challenge for him while starting the course was procuring ghumats. He had to contact people from the Kudubi tribe in Uttar Kannada to make them for him. With the certificate course coming to an end and in view of its immense success, Fr Santhumayor plans to continue the course with Joel continuing as the resource person. The first batch of students trained by Joel are all set to perform at other colleges and events in the near future to inspire other youth. As for Joel, who made sure that his children Kenny, who is pursuing engineering, and Kate, who is in Class 11, are trained in the traditional instrument, he says he is happy that educational institutions are making an effort to revive the dying art form.